Well we got the painting done for the nursery - which makes it feel like things are coming together. I've really wanted to put together a Beatles inspired nursery -- that wasn't "Yellow Submarine" since if you Google it that's all you find. I still wanted it to be a little girly. After much back and forth -- I thought I'd share the inspiration board I designed. So here it is. The wall color is White Dogwood from Sherwin Williams - and I really love it. The bottom half of the walls is wood paneling and this pale pink goes nicely with it. The hubby kept asking before we painted if it was going to look pink. Now he keeps saying "It's pink." So if you're looking for a color and worry it looks too light - don't. 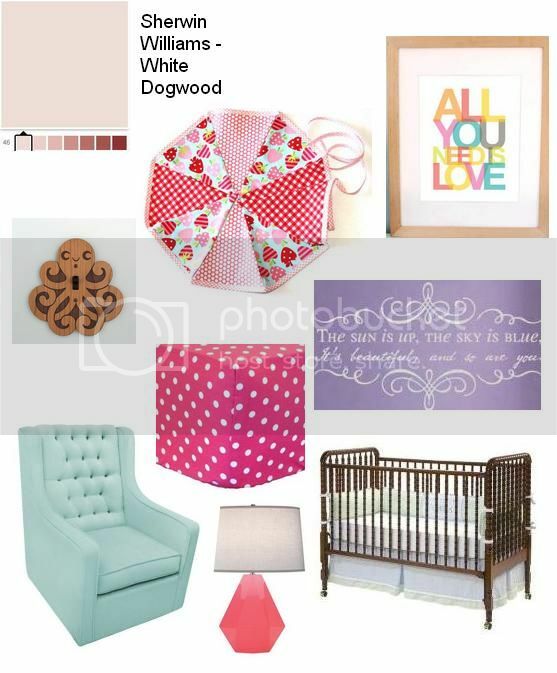 I had seen the color on many posts over at lay baby lay (a great source for nursery inspiration) - and loved it. The items in the board are as follows (none of which I actually own yet - so I can't attest to the quality, etc.) Fabric Strawberry Fields Bunting from Etsy, All You Need is Love Print from Etsy, Octopus Switchplate from Etsy, Strawberry Fields crib sheet from Amazon, Dear Prudence Quote Vinyl Wall Decal from Etsy, Rockabye Glider Co. Aqua Glider from Target, Robert Abbey Delta Schiaparelli Pink Lamp from Lamps Plus and the Davinci Jenny Lind Crib in Cherry from Amazon. You are definitely in the nesting stage. :) This is beautiful, I can't wait to see the finished nursery!